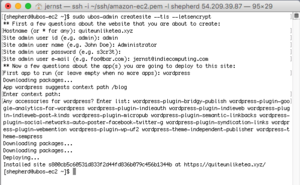 For this tutorial, we assume that you have set up an Amazon Web Services EC2 virtual server, and you are able to log into that server with ssh. We also assume that you have acquired a domain name for your site and you have set up DNS so it points to your virtual server. 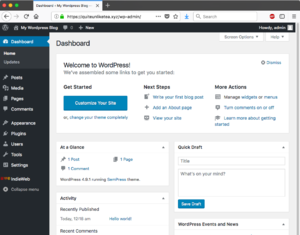 Now you can install Wordpress and the Indieweb plugins. While we are at it, we will also get an https certificate for your site from Let's Encrypt, so all web traffic to and from your site will be encrypted and protected from tampering. This will update your virtual server to the latest code. This will just print a few progress messages. You will notice that every time you can enter a command into the terminal, the terminal first prints [shepherd@ubos-ec2 ~]$. While this might look cryptic, the operating system is trying to be helpful: it says you are currently logged into a computer called ubos-ec2 (remember, you are running UBOS on Amazon Web Services EC2). This makes it less likely that you enter a command into the wrong terminal that isn't logged into that virtual server, or into a different virtual server! This command should print out nothing and also not report an error. and answer the questions as they are presented. For Hostname, enter the domain name of your site. For this tutorial, the domain name is quiteunliketea.xyz. Yours will be different. For Site admin user id, enter the name of the Wordpress user you will be using the administer the site. A good choice might be admin. For Site admin user name, enter the name of the administrator as visitors to your site might see it. Administrator might be a good choice. For Site admin user password, enter a good and strong password that only you know. We suggest something at least 8 characters long, and not only consisting of legal words in any known language. For Site admin user e-mail, enter an e-mail address at which you can be reached for matters relating to site administration. Wordpress will send notifications to that e-mail address. 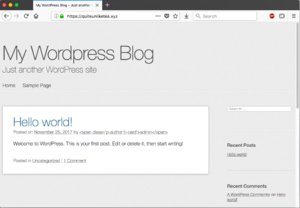 For First app to run, enter wordpress. For Enter context path, enter nothing and just hit Enter. For Any accessories for wordpress, enter the list of Indieweb Wordpress accessories. That's quite a list, and it is easiest if you just copy the following text and paste it into your terminal. They all need to go on the same line, do not press Enter before you have them all. If you made a mistake, you can hit control-C and start over. Once you hit return, there will be some progress report ("Downloading packages ... Deploying") and you will need to be patient for a few minutes. Finally, it will say "Installed site s.... at https://quiteunliketea.xyz/" or whatever your domain name is. The screenshot to the right has the full transcript. 4. That was too easy. Let's check by using a browser to go to your domain name. In our example, that is https://quiteunliketea.xyz/ and indeed, as you can see from the screen shot on the right, here's our site! 5. Log into your new site as the administrator: first you need to find the login button, it's hiding further down the right column. You might need to scroll down. 6. Click the "login" button on your new site, and enter the username and password of the administrative user you created above. 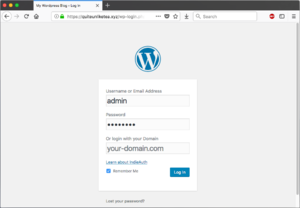 You will notice that the usual Wordpress login dialog has an extra "Log in with your domain" field -- the Indieweb plugins are working! 7. Your site is running, https and all, and you logged on as the administrator. Congratulations! This page was last edited on 12 December 2017, at 17:11.